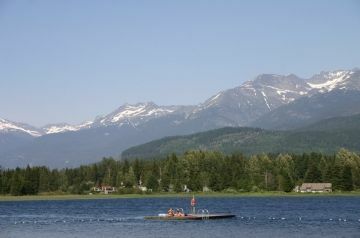 Detailed Description: Rainbow Park near Whistler, BC, Canada was once a lodge accommodation operated by one of the pioneers of the Whistler, BC, Canada named Myrtle Philip. From 1914 the lodge was one of the main destination accommodations for honeymooners on the west coast. Today, in the park, there are some of the old heritage buildings from days gone by. 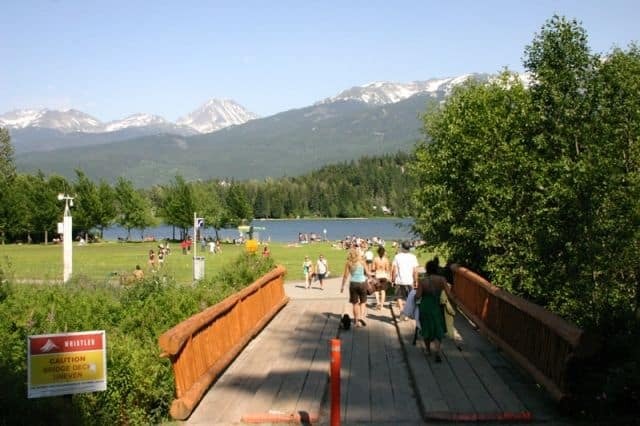 Rainbow Park is one of the more popular beach park destinations for families and couples in ,Whistler, BC, Canada, because the water is so shallow, clear and... because the park is so easy to access by car and bike as it is connected to the Valley Trail system. It is because of this reason the lake attracts large groups of people who like to lounge around in the sun, have fun and go swimming. 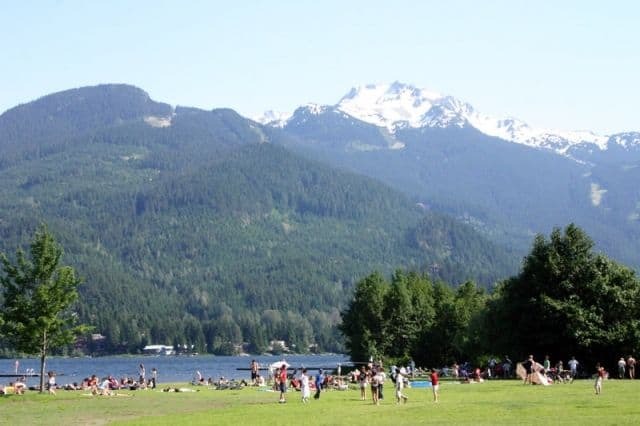 The Whistler, BC park is a fully services park with many of the spoils that make beaches fun. 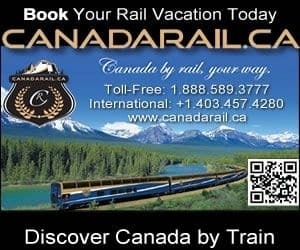 There are BBQ pits, picnic tables in the sun and shade, beach volleyball courts, a floating swimming dock, a pier, a summer concession stand, vending machines, fresh water fountain, a boat dock, a grassy field, washroom and change room area. There is even an off leash doggie park called Barking Bay Dog Beach. If you decide to drive to Rainbow Park, there is some parking but it may be wise to bike! The parking lot can be crowded and tight going at the best of times. The street parking is not very much better and is not advised as room is limited. How to Get Here: The park is best accessed from Alta Road. From Hwy 99 (Sea to Sky Highway) take a left soon after passing Function Junction onto Alta Rd . Continue driving for 7 Km until you come across a sign on your right with Rainbow Park on it. The park is also accessible from the Valley Trail.